“When I was in my late 20's living in a suburb of Los Angeles, I was driving alone towards a shopping center near my home. It was about 2:30 on a weekend afternoon. And, as usual, I saw people (adults) walking on the sidewalk and happened to be looking on the left. There was a couple walking together and other people walking individually. About every other persons face that I saw was "smooth". They were flesh colored -- but the face absolutely had no features. I thought that I had to be losing my mind? I braked instantly and turned my head to be able to see more clearly and again, I saw that there were people who had faces and those who didn't. I've never seen that again and pretty much kept it to myself until one day my sister and I were talking about strange things that we had seen over our lifetime. And, my sister tells me the story of when she and her husband had first got married and had became very involved in the Christian church that they went to. They had left church one Sunday evening and had gone into a near by McDonalds that was always quite busy. They had taken a seat in one of the booths. Her husband excused himself to use the men's room. My sister sat alone waiting for him to return -- when all of a sudden this man in a dark rain coat came up to their table and stood there and when my sister looked up into his face -- his head was shaking abnormally fast from side to side -- so fast that she could barely make out his features. But, she could see that there were no facial features, there was no nose, no eyes or mouth. She said that about the same time her husband was on his way back to the table and as he was walking up -- he saw the terror on his wife's face and he yelled at the man and ask him, "What are you doing? Get away from my table! Get away from my wife!" The man turned so fast and hurriedly walked away and out the doors of the restaurant. I had never told anyone about my seeing the people on the sidewalk that day that had no facial features. And, I was so amazed that my sister had her own experience with seeing one. So, I then told her what I had seen. 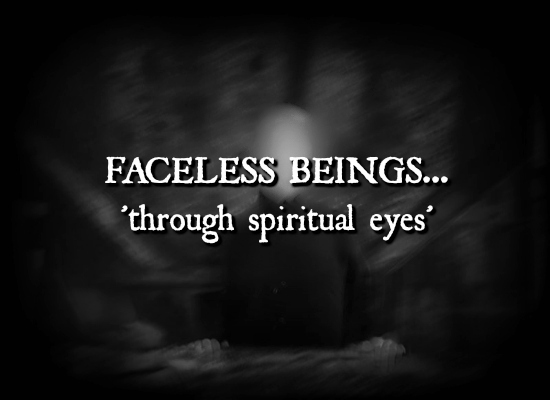 My sister's husband told her that he feels that sometimes -- some of us -- are able to see others "through spiritual eyes" and that our spirits (our souls) are able to see demonic beings that are walking among us. And, that made a lot of sense to me. I think that we each have the ability to see evil spirits that are among us -- but it is on very rare occasions that the ability is tapped into. Or perhaps, it's that God prevents us from seeing them because they are so frightening and for us to see them would be too much. I had no idea that there were so many other cases out there where others have seen the same thing? Finding this video amazed me and gave me chills to know that what I saw wasn't a hallucination. And, that I'm not crazy!"